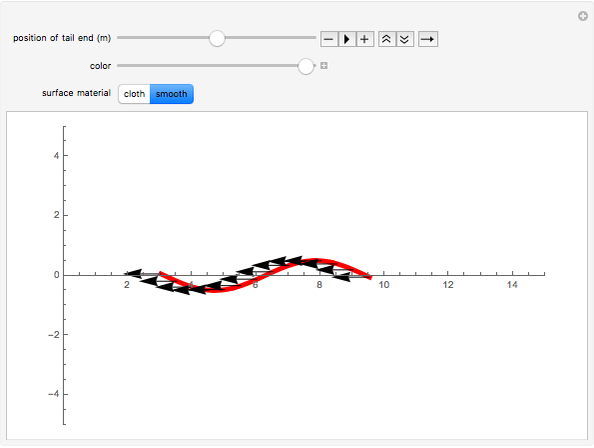 In this Demonstration, a curve of fixed length represents a snake as it moves in one direction in a plane. 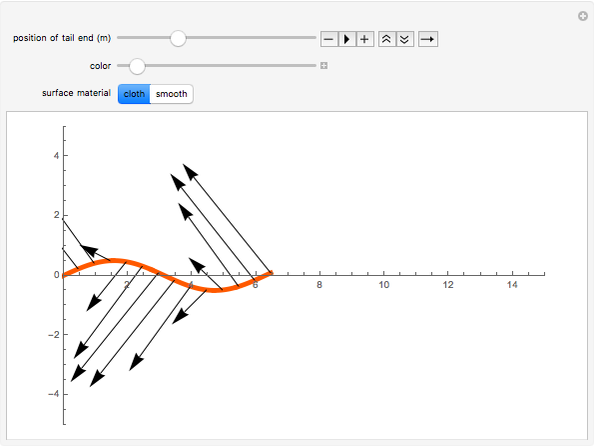 As time increases, the curve advances forward, with plotted vectors representing frictional forces exerted by the snake on the surface at various points along the snake's length. It is shown how different selected materials affect a milk snake's locomotion. These force vectors are calculated using the proposed equation from David Hu's study . The function is defined by . The Demonstration is based on this proposed formula. The vectors point in the opposite direction to the snake's overall velocity because the force of friction between a snake's scales and the surface propels that part of the snake in the opposite direction, according to Newton's third law. The control "surface material" changes the forward, backward, and lateral coefficients for a cloth surface and those for a smooth fiberboard. 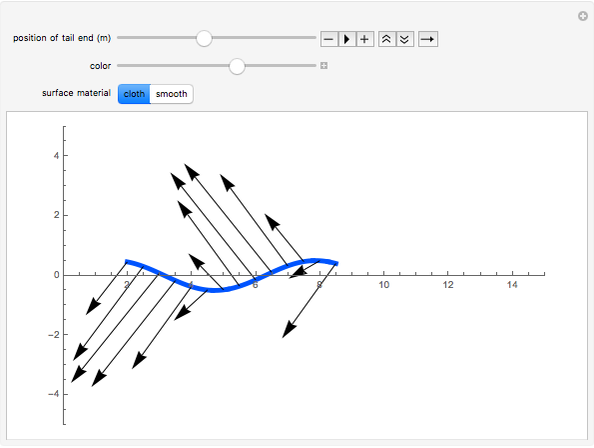 With cloth, the frictional forces are larger because the coefficient of friction between the snake's skin and cloth is greater than the coefficient of friction between the snake's skin and smooth wood. It can be noted that the lateral components of friction diminish greatly on the smooth surface, because the coefficient of friction on a smooth surface is the same regardless of the snake's orientation, while on a rough surface the lateral frictional coefficient is much greater than the forward and backward coefficients. D. L. Hu, J. Nirody, T. Scott, and M. J. Shelley, "The Mechanics of Slithering Locomotion," Proceedings of the National Academy of Sciences, 106(25), 2009 10081–10085. doi:10.1073/pnas.0812533106. New York University. "Snakes Use Friction and Redistribution of Their Weight to Slither on Flat Terrain." www.nyu.edu/about/news-publications/news/2009/06/08/snakes_use_friction_and.html. Christopher Umeki and Gregor Wettermann "Model of Snake Locomotion by Frictional Forces"